Axari Hotels is located along the Murtala Muhammed Highway, off zone 6 roundabouts by Winners way, Ikot Ansa, Calabar, Cross River close to the Wildlife Conservation Society. Rooms at the Axari Hotels are categorised as Executive rooms, Deluxe, Axari Double, Executive Suite, and the Jacuzzi Suite. 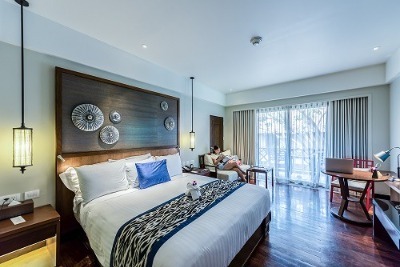 These rooms come with great facilities like king-size beds, air conditioning, flat screen television sets with multi-channel cable TV subscription, wireless internet connection, private bathrooms with stand-in showers, work desks and chairs, plus sofas and centre tables. Axari Hotels also offers top range infrastructure like a swimming pool, bar/lounge with a collection of excellent beverages, a restaurant that offers guests complimentary breakfasts, round-the-clock power supply, and a standard gym for guests to keep fit. Extra services on offer at Axari Hotels include: round-the-clock room service, concierge, spa, beauty services, ATM, and Car hire services. Q: Is there a gym at Axari Hotels? A: Yes, there is a well-equipped gym in this hotel. Q: Is there an adequate parking space at the Axari Hotels? A: A sufficient car parking space is available at the Axari Hotels. Q: Does the Axari Hotels offer Internet connection access to guests? A: Guests at the Axari Hotels get to enjoy free high-speed wireless internet connection. Q: Are there any extra services offered at the Axari Hotels? A: ATM, Concierge and Spa services are available to guests at the Axari Hotels. Axari Hotels is a budget hotel in Calabar, Cross River. The hotel was beautiful and I am highly impressed with their services. The hotel had excellent customer service, beautiful environment and wonderful staff. My room was comfortable and well kept. There was constant supply of power and water, clean towel, toothpaste and soap. Everything needed to make me comfortable was available in the bathroom and I hope they can keep it up. The facilities was okay apart from the fact the power supply kept on going off and on, and later the AC in my room developed problem but in all it was okay. Have nice pictures of Axari Hotels ?